Dogs are great at finding dead bodies, but there are some places the helpful canines just can't go. Solution? Trained vultures. The plan hatched by German police officials is to attach a GPS locator to the carrion birds and use their training in conjunction with the birds' natural proclivity for rotting flesh to sniff out corpses. What firmly sets this plan in "seriously, why didn't anyone think of this before?" territory is how incredibly mobile the birds are. Corpse dogs (the currently preferred method of locating dead bodies) are able to cover huge tracts of land, squeeze into tiny spaces and generally outpace humans, but vultures can fly. When trying to locate a corpse in a heavily wooded area (read: exactly the sort of place one might dump a body), that literal bird's eye view is invaluable. Additionally, vultures absolutely love dead bodies. Not in a creepy romantic way, but in a creepy "I want to eat your rotten parts" way. 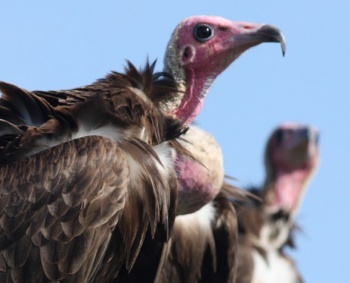 Due to this affection for spoiled meat, the last few million years of evolution have given the vulture the ability to sniff out a body from 3,000 feet away. Of course, the birds do require some human guidance. Specifically the vultures have to be trained to only seek out human bodies, instead of some unlucky rabbit who met the sharp end of a mountain lion a few nights previous. Presumably, police are also attempting to train the vultures to not actually eat the bodies once they are found. "If it works, time could be saved when looking for dead bodies because the birds can cover a much vaster area than sniffer dogs or humans," said German policeman Rainer Herrmann.